Transparency Market Research (TMR) has published a new report titled ‘Surgery Tables Market - Global Industry Analysis, Size, Share, Growth, Trends, and Forecast, 2018–2026.’ According to the new report, the global surgery tables market was valued at above US$ 700 Mn, in terms of revenue, and stood at over 45,000 units, in terms of volume, in 2017. It is projected to expand at a CAGR of almost 3.0% from 2018 to 2026. Rise in the number of surgeries, significant government funding for health care infrastructure, and widespread regulatory support for product approvals are likely to boost demand for surgery tables during the forecast period. North America and Europe are likely to dominate the global surgery tables market due to well-developed health care infrastructure and adoption of hybrid operating rooms in the market in these regions. 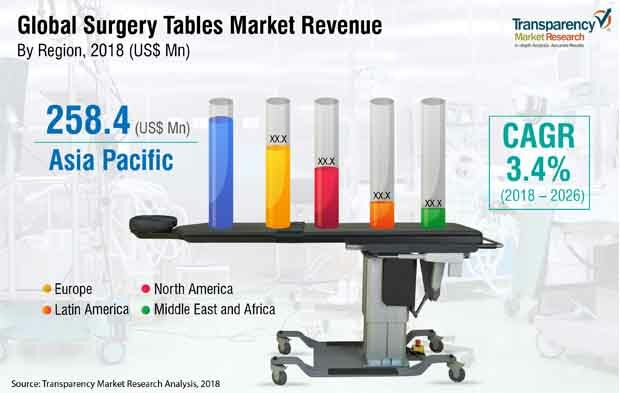 Increase in the number of hospitals; improving health care infrastructure; and rise in per capita health care expenditure in countries such as Japan, China, and Australia are likely to boost the surgery tables market in Asia Pacific in the coming years. High price and high maintenance costs of surgery tables are projected to limit the purchases of new and replacement units. The average cost of an orthopedic table and spine surgery table is above US$ 70,000. Constant evolution in surgical tables with the introduction of new facilities has led to high price of the products. Such high prices of specialty tables can limit their purchase. This is anticipated to hamper the growth of the surgery tables market. The report offers detailed segmentation of the global surgery tables market based on type, application, end-user, and region. Based on type, the powdered segment is projected to dominate the global market due to the presence of major players in the segment and increase in demand for technologically advanced surgery tables to perform surgery with the best possible position. The non-powered surgery table segment is expected to lose market share during the forecast period, due to an increase in demand for powered surgery tables in order to perform surgery more conveniently, which is not possible with non-powered tables because of their limited features. Hence, the market share of the segment is anticipated to fall from 4.0% in 2017 to 3.0% in 2026. In terms of type, the general surgery table segment is projected to account for a dominant share of the global surgery tables market during the forecast period. The segment is likely to expand at a CAGR of above 3.4% from 2018 to 202 due to widespread use of general surgery tables in all types of surgical procedures and their low price. Increase in emphasis on diagnostic imaging and rise in preference for C-arms in hospitals and other health care facilities are leading to an increase in demand for radiolucent imaging tables in the global market. The imaging tables segment accounted for more than 11.0% share of the global surgery tables market, in terms of value, in 2017. The segment is anticipated to expand at a rapid pace in the near future. In terms of value and volume, Asia Pacific held a major share of the global surgery tables market in 2017. This is due to high investment in health care infrastructure and a larger installed base of aging surgical tables in hospitals in countries such as India and China. Moreover, rise in the adoption of powered surgery tables compared to the non-powered ones is expected to drive demand for new or replacement units in Asia Pacific. Hospitals and health care facilities in North America and Europe are witnessing a transformation through consolidation, which has resulted in an increase in the number of large independent outpatient clinics. This is propelling demand for new and replacement units of surgery tables. Economic growth in countries such as Brazil is boosting investment in health care infrastructure. This is likely to drive the market in Brazil in the near future. Moreover, new pipeline hospital projects and increase in medical tourism have resulted in the development of state-of-art hospitals in countries such as Mexico. These factors are likely to propel the surgery tables market in Latin America. The market in the region is expected to expand at a CAGR of above 3.3% from 2018 to 2026. The report provides profiles of leading players operating in the global surgery tables market. They include Stryker, STERIS plc, Hill-Rom Services, Inc., Mizuho OSI, Getinge AB, Surgical Tables Inc., AMTAI Medical Equipment, Inc., BARRFAB, and Merivaara Corp.. Market players adopt strategies such as expansion of product portfolio by developing new products or through acquisitions and licensing agreements. For instance, in January 2017, Stille AB acquired Acroma North America Inc., a domestic manufacturer and distributor of surgical tables in the U.S. and Canada. The acquisition is anticipated to enable Stille AB to expand its geographic presence in North America, leveraging the strong distribution network of Acroma North America Inc.. Other key players are also adopting similar strategies.